Let Republic Packaging design the protective packaging for your product and we will perform the drop test on your new design at no cost as part of our service to make certain your new package will meet all necessary requirements. This instrumented test will record the G-level experienced during the free-fall drop. 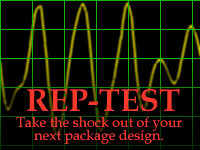 REP-TEST is a computerized drop test system that we've developed to conduct physical drop tests to simulate shocks that your product may encounter in the distribution environment.